My 1980 Model Sporter (SP1) Pretty similar, except for the barrel of course, smooth grip. Same aluminum collapsible stock. No forward assist, does have a dust cover. Nice. Mine has newer plastic stock, older ones have the aluminum- I like yours better! I have a 1967 SP1, but I didn't buy that new, so it doesn't count. I've got a stack of these worthless things. This is probably my favorite old receipt. does anyone remember, was there a gun store or sporting goods store on Main st in farmingdale where croxleys is now? for some reason I feel like I remember there being something there. I think there was a military surplus store there. Yes, they dealt in lots of precision stuff. I got one too. But know someone who has one of these. Think it's any good? Precision Sportsman, I think the owner was Neil. Bought an M1a from him. I don't think he was around for very long. Doing some spring cleaning/organizing and came across a few old receipts that put a smile on my face. US Gun and Knife Co.!...just down from Karl Ehmer's, by the 7th Pct. Yup, bought my Colt CAR there for around 525, bought another one a little later from Marty for around the same price. didn't he later have a smaller store? He dealt in a lot of competiton gear. Actually he installed the 1/2 MOA sights and smaller aperature and post on my HBAR back in the mid 90's. I also almost bought an anschutz from him but realized I didn't really like smallbore as much as I liked service rifle. I bought that CAR from US Gun & Knife then brought it to Marty to have the barrel chopped and the long flash suppressor welded on - to make it look like an early military version. Also, I bought an Aimpoint 2000 from "The Gun Shop" on Conklin in 1986 - to put on my Ruger 10/22. A "dated" receipt is a surefire way to get caught sneaking "this ole thing" into the house. 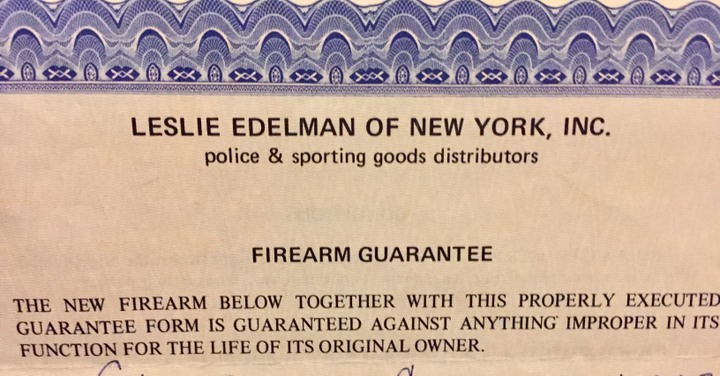 But, I do have the original receipt for my 1959 Colt Woodsman Match Target, and my 1969 Colt Cobra. I also have the original box of ammo ,,, minus 6 rounds.